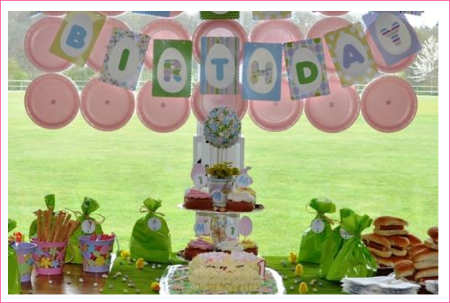 The birthday girl, born on the 6th April and being Easter Friday this year, it was only natural to plan an Easter themed party. 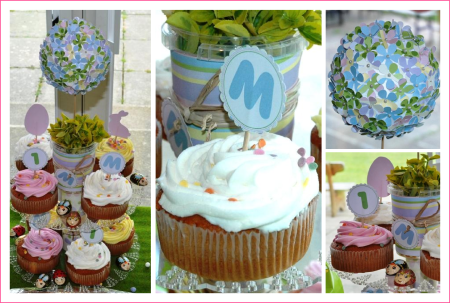 Some more pictures below with cute ideas that can be customised for any birthday party or baby shower. The cake was a success, but with added stress, from my dear friend Leandri (mummy of Maya) and me! Have to say I am awfully proud of our little bunny. I loved making this simple but so effective paper flower topiary tree I used as the centrepiece of the table. You can find the tutorial here. Something healthy amoungst all that yummy chocolate and cake: Veggie Shots! These are just selected veggies cut into batons and placed into a shot glass half filled with humous – nom! I found some adorable little pink marshmallow bunnies and placed them on top of a pink and white marshmallow biscuit to create a Marshmallow Pop!